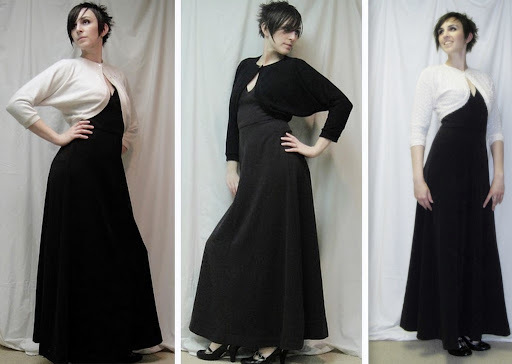 I’m pretty happy this year with keeping my Me-Made May posts off-blog—the outfit shots seem to make sense on Instagram, Twitter, and Flickr—but since I never actually blogged this little shrug, I thought I’d throw it in here. After I made my Tiramisu last winter, I had just enough of my green wool jersey (exclusive of moth holes) to squeak out another version of my vintage shrug pattern, something I’ve been meaning to do for AGES. However, I finished this one (they are very quick to make) and promptly stuffed up royally on the buttonhole. I seem to recall putting something in the instructions about making the buttonhole before you attach the neck band, but why would I read my own instructions? /headdesk. Because getting a buttonhole centred on that little band (in a knit!) after it’s attached is nearly impossible, doofus. Inserting a wee bit of interfacing inside the end of the band would probably be a good idea, too, come to think of it. Hindsight 20/20, etc. Anyway, due to this stuff-up, it languished for most of the winter until I finally bestirred myself to sew a hook and eye on (I was dreaming of a pretty black knotted frog clasp, but was far too lazy to make that happen. Yet, anyway. Even wearable, it’s not as versatile as my cream and black versions are, because I’m still a bit hesitant in my colour pairings. I tend to only want to wear it with something black. Frankly, I tend to only wear it with this dress. But I do really like it with this dress. I have noticed something about the shrugs—I really like them to fit SNUGLY. I never wore my first clone (or the original, for that matter) much because they were a bit loose around the body. When I graded the pattern, I made my cream version out of the size small and liked it MUCH better. Last fall some time I got up the courage to do surgery on the first (black knit) clone. I didn’t change the sleeve length, but I did take in the entire under-arm seam on both sides, just a little bit at the arm (which is quite close-fitting) to a couple of inches off the side. This adds a seam to the hem band at the side, but made the whole thing fit just how I like it—like the picture on the right. Being able to do this alteration right at the end is handy given the way knits sometimes stretch unpredictably, too. I’d probably find the same problem wearing a teal shrug – adoring the colour but only pairing it with a very safe black outfit. It’s lovely. I bet it’s the right level of warmth in that wool. It’s pretty good, actually. I often get too warm at work (although I think that may be done now that we’re into summer-air-conditioning mode) and these shrugs are just right. They’re also perfect with the fluffy dresses that don’t look good with any of my other sweaters/jackets. Very cute! I think I like the teal version better than the black and cream ones. Also, I like your phrase “stuff-up”. Parents of (pre-)teenagers have the best non-swear swear words!